WILL CARLING said it this week – forget the form guide, every Six Nations match is a huge hurdle. France finally turned up at this championship and England were made to dig deep to win a game that looked in the balance for an hour. Ultimately, it was Manu Tuilagi’s fortuitous try on 55 minutes that proved decisive. “It was a proper Test match,” said England coach Stuart Lancaster. 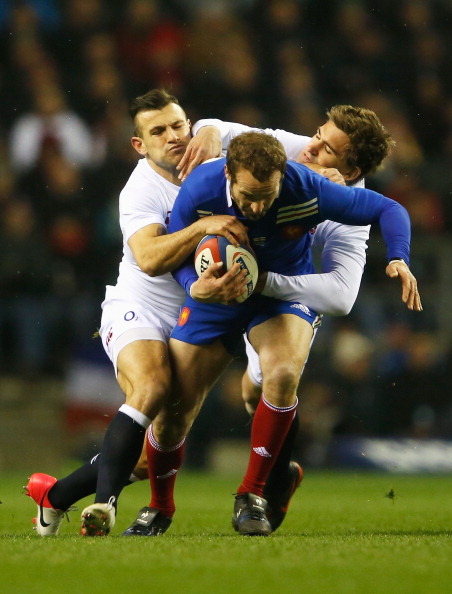 The pre-match predictions that France would struggle to last the pace proved accurate, England taking control in the last quarter as the French grew increasingly desperate. Two penalties by Toby Flood, on for the injured Owen Farrell, took England clear and France were left to rue the continued shortcomings of Freddie Michalak, who was introduced on 50 minutes for Francois Trinc-Duc because of his goal-kicking prowess. His wild passes merely bolstered English optimism. France, with Thierry Dusatoir imperious once more, edged the battle of the breakdown but England had the telling thrust behind in the shape of Tuilagi. Chris Robshaw and Tom Wood made the carries and Farrell kicked the points on offer, penalty opportunities on two, 26, 32 and 47 minutes keeping the visitors at bay after they scored one of the better individual tries seen at Twickenham. It was scored by Wesley Fofana, who evaded attempted tackles from Courtney Lawes, Joe Marler, Chris Ashton and Ben Youngs as he jinked and sped down the left-hand flank on the half-hour. Ironic that the try came so wide out having just reverted to his preferred centre position. Morgan Parra converted for 10-3 but that was as good as it got for France. England clawed them back and, with Italy next up at Twickenham, a near certain Grand Slam decider looms for Lancaster’s team in Cardiff next month. 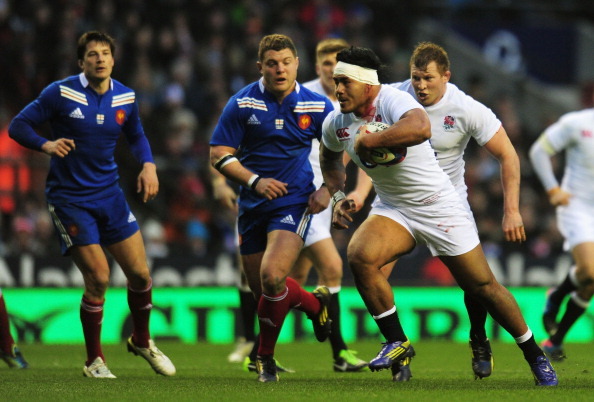 The try by Tuilagi that took England seven points clear. Alex Goode launched an up and under which was initially claimed by France, but as the ball went to ground Wood swung a boot and the ball ricocheted off Mako Vunipola into the grateful grasp of Tuilagi – in acres of space on the left. The chasing Vincent Clerc had no chance. Chris Robshaw’s 15 carries helped win him the BBC accolade, but there were equally commendable contributors in the pack. However, look no further than the blood-splattered Tuilagi, who won the gain-line collisions with fellow behemoth Mathieu Bastareaud. He made 57 metres and his performance made a mockery of suggestions he should have stayed on the bench. He was still smiling afterwards despite having 20-odd stitches in a wounded ear. Does the young lock ever have an ordinary game? Once again, he marauded around the pitch, making tackles (15 in all), soaring to take restarts and flying into the rucks. The case for starting him and Geoff Parling in the Lions engine room is becoming irresistible. So much more than England’s best scrummaging tighthead. His work in the loose is phenomenal, with his strength over the ball at the breakdown making him one of the best turnover specialists around. Still don’t know why he was sin-binned in the final minute! Phil Dowson was the glue that held the England pack together at the start of Lancaster’s reign – now that mantle belongs to his Saints team-mate Wood. He was at his best when the heat was at its most intense, making a dozen tackles to go with his ten carries and a crucial interception as France threatened a comeback try. Making his first Six Nations start on his 18th appearance, Lawes looked like he was trying too hard. He tore about the pitch but lacked accuracy in his hits, and England seemed to suffer from a power shortage on his side of the scrum. Brilliant athlete but not the performance he would have hoped for on his 24th birthday. Replaced with half an hour remaining. Still not doing enough if he wants to stay ahead of the competition for the Lions’ right-wing berth. His double miss in the Fofana try – he was sidestepped too easily and then failed with a last-ditch tackle attempt when giving chase – will concern Warren Gatland. Louis Picamoles made 17 carries and 81 metres – topping the French figures in those areas. 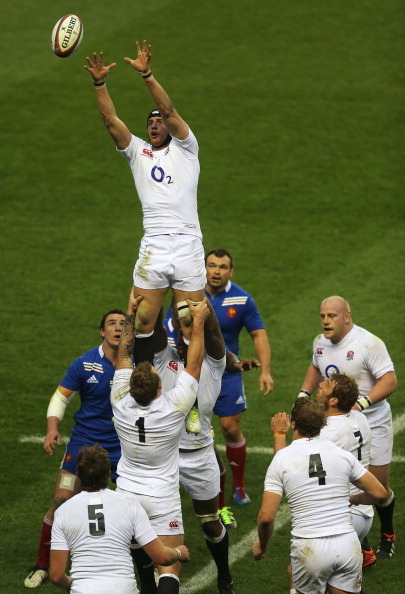 France won seven turnovers to England’s two but were hampered by 13 handling errors, as opposed to only four by England. England: Try: Tuilagi. Pens: Farrell 4, Flood 2. France: Try: Fofana. Con: Parra. Pens: Parra, Michalak.